Sen. Orrin Hatch (R-UT) accused Democrats of going on a “fishing trip” for scandals in President Trump’s Supreme Court nominee Judge Brett Kavanaugh’s past. Senate Democrats are currently threatening to sue if their Freedom of Information Act (FOIA) request for all documents related to Kavanaugh’s time in the George W. Bush White House is denied. Hatch also emphasized the lack of a "smoking gun" in the documents that have been released so far. "Consider the damning evidence already uncovered in these documents,” Hatch commented. “Judge Kavanaugh goes to church on Sunday morning, he appreciates pizza when he’s working late, he thought the last play of a Redskins game was ‘a total disgrace.’"
"What more do we have to learn about Judge Kavanaugh before we can see him for what he truly is: Joseph Stalin without the mustache or as one of my colleagues so calmly put it, a man who will ‘pave the pave to tyranny,’" Hatch continued, referencing a remark by Sen. Jeff Merkeley (D-OR). Hatch went on to say that although Kavanaugh “may seem like the human incarnation of a vanilla ice cream cone,” he’s “actually something far more sinister." "Judging by the rhetoric coming from the left, I’m convinced that this minivan-driving carpool dad is actually the second coming of Genghis Khan," he concluded sarcastically. "It’s time Democrats come home from their fishing trip. 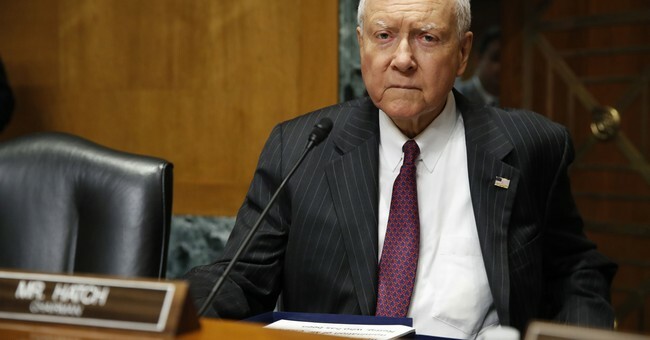 We could spend eons angling for scandal in the river of documents the Judiciary Committee has provided us," Hatch argued. "But nothing will bite because there’s nothing there. Democrats know this by now, and it’s time they admit it to the American people. The longer they wait, the more desperate they look." A confirmation hearing for Judge Kavanaugh is set for Sept. 4.